Discussions about Sherlock Holmes’ Myers-Briggs® type can get pretty heated in the online community. He’s either an INTJ or INTP and whichever side you come down on (if you care about this sort of thing) is worth passionately defending. I’ve weighed-in on this myself in a blog post arguing that Sherlock as portrayed by Benedict Cumberbatch in the Sherlock BBC series, Robert Downy Jr. in the Sherlock Holmes movies, and even the Basil of Bakerstreet version from Disney’s The Great Mouse Detective are all INTPs. I do think that’s the best-fit type for all three of those versions, but they aren’t the only portrayals of Sherlock Holmes. We ought not forget, for example, the original character in the stories penned by Sir Arthur Conan Doyle. I’ve been reading and re-reading several of those for my Classics Club book list and Sherlock doesn’t seem very much like an INTP in those stories. In fact, the only thing I can say with absolute certainty is that he’s a Thinking personality type. That brings us to the second part of this post’s title: the trouble with typing fictional characters. Though I love looking at fictional characters’ personality types, there are limits to how accurately you can type them. It gets especially tricky in the case of someone like Sherlock Holmes or Batman because so many writers and actors have been involved in portraying this character over quite a long period of time. There’s bound to be some inconsistencies in how each creative sees the character they’re working with. Plus, I doubt very many of them think about the character’s Myers-Briggs® type and how they can keep it consistent in every portrayal. Going back to Sherlock Holmes as our example, Sir Arthur Conan Doyle sometimes writes him in a way that looks like ISTJ, sometimes more like one of the NTJ types, and sometimes with traits of a TP type. He also calls Dr. Watson by two different first names (John is used three times, James once), so I think it’s safe to say Doyle wasn’t all that concerned with consistency. In any case, Doyle’s Sherlock Holmes stories were written about 30 years before Jung published Psychological Types, so we know he wasn’t relying on those theories when writing the character. Since it’s difficult to type fictional characters with a high degree of accuracy, why do it? For one thing, it’s fun. It’s one of the ways to turn an interest in Myers-Briggs® into an entertaining pastime as well as a useful hobby. 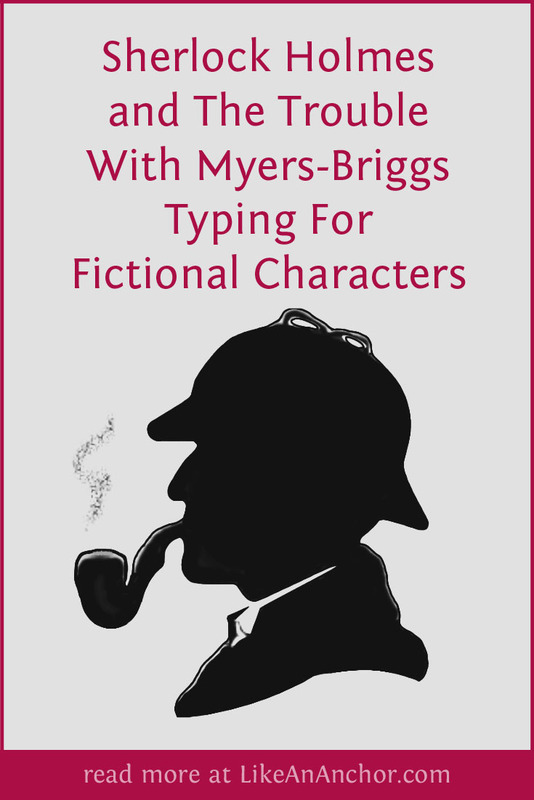 Typing fictional characters can also sharpen our skills typing real people. It gives us a chance to study how characters react and puzzle out which psychological functions they’re using based on what they say and how they act. In addition, well-written characters provide familiar examples of the different types to use in every-day conversation. If someone asks me what an ENTP or ISFJ, for example, looks like in real-life then Tony Stark and Samwise Gamgee are there to help clarify things. Do you enjoy trying to figure out fictional characters’ personality types? Tell us about your favorite characters and what you think their types are in the comments!